The staircase in our unit has been a bit of a hassle. The guy fabricating it does good work, but he’s not a big fan (or follower) of plans. Explain what you want to him and he’ll get it done, but when the architect insisted on shop drawings he resisted. I remember one time there was a panicked call about the stairs (“the architect miscalculated”) and I rushed down to the job site just to find that the confusion was easily cleared up by looking at the plans where it was all quite clearly laid out. Stuff like that has happened more than once – now I just take it in stride. Anyway, when the stair guy resisted shop drawings it was with the proviso that if he didn’t have shop drawings he’d have to correct whatever we didn’t like. So in round one he did the stairs the way they were laid out on the original plans and delivered them to the job site the day after the architect had figured out there was a design flaw and they couldn’t be done that way. So the stair guy just put everything back in his truck. In round two we discussed doing them one way but in actuality they couldn’t be done that way because the steel had to be cut at one point and it was cut so much it was too weak. It was something that would have been discovered with a shop drawing, so 2 of the 3 runs of the stairs had to be removed and redone. You’re looking from about the entry way. To the right in the foreground is the kitchen. Under the stairs against the wall will be a powder room which is turning out to be surprisingly big. Beyond the stairs is the dining room and then the living room. You can see the platform has been framed in. There will be stairs going up and down from there. You can also see that the stairs are open to the cellar “storage area” (media room / work room). 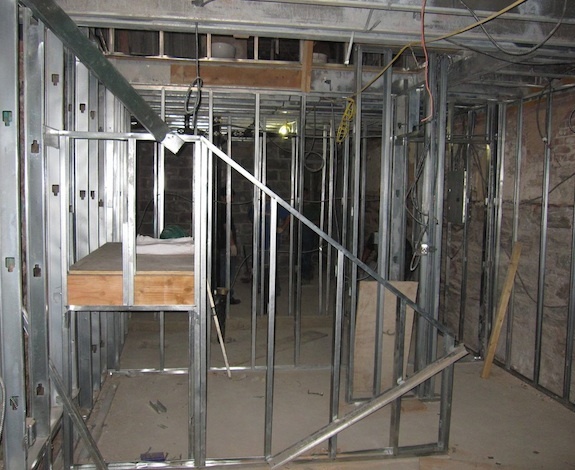 There will be a door to a closet / storage area under the stairs (barely visible in the photo), and a small door to get to the less accessible space under the stairs (which is quite visible in the picture. One huge plus about the rental apartment is that it will have tons of storage. There’s a huge laundry room with plenty of space for storage, plus all the space under the staircase, plus two closets on the ground level. Hopefully that will make it stand out compared to most New York apartments that have just tiny amounts of storage space. 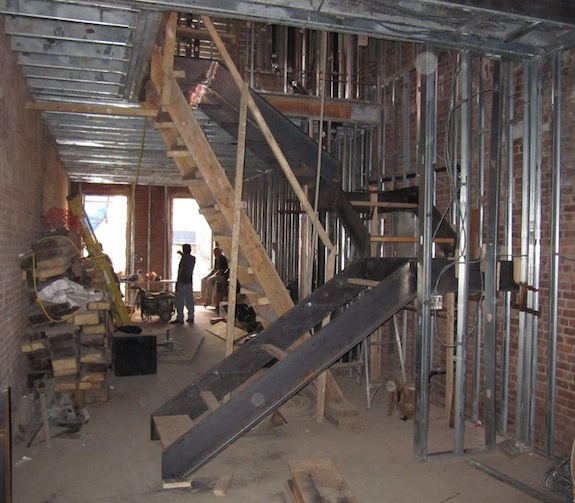 This entry was posted in Construction & Renovation and tagged Stairs, Townhouse Renovation, West 123rd Street Harlem Brownstone by Jay. Bookmark the permalink.